Facts about Alligators. Alligators are one of the few reptile lineages that existed both before and after the dinosaurs. Alligators are part of the genus Alligator and the family Alligatoridae. "Scientific name for American alligator is Alligator mississippiensis". This means Mississippi Alligator in Latin. The American alligator lives in the southern United States from the Atlantic coast to the Mexican border. Alligators are raised commercially for meat and their skin. Alligators are also hunted across the Southern United States, with hunting season starting in September in Texas. Female American weigh around 180 to 250 pounds (82 to 113 kg) at maturity. Females are around eight feet long, while males are eleven feet long. Both male and female alligators have an armored body. They have flat muscular tails. Their short legs carry them around slowly on the ground but aids in swimming and climbing in the water. American alligators have four toes on their back legs and five toes on the front legs. Alligators have a long snout with nostrils on top to allow them to barely surface to breathe. 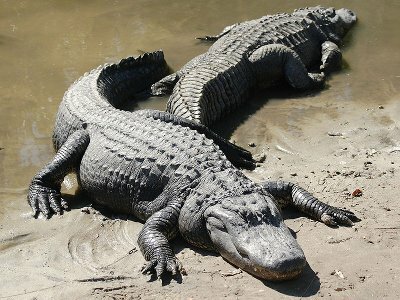 It has been said that you can tell the difference between a crocodile and an alligator by the alligator’s A shaped nose. Mating occurs in May. Alligators lay twenty to fifty eggs per clutch. Alligators are unusual in that the gender of the young is determined by the temperature of the eggs in the nest. If the temperatures are above 93 F (33 c), all young will become male. If the temperature in the nest is below 86 F (30 c), the young are all female. An intermediate temperature means some will be male and some will be female. The mother Alligator covers the nest with nesting material and tries to regulate its temperature while protecting the eggs from predators. Red bellies sliders will simply add their own eggs to the alligator’s nest. The female protects the nest for the two month incubation period before young hatch. Young alligators are protected by the mother for around two years before being sent to establish their own territories. Young alligators have yellow stripes on their tail that darken with age. Alligators reach breeding age when they are six feet long, usually when they are ten to twelve years old. American alligators live thirty to fifty years in the wild. Young crocodiles and alligators are prey to birds and anything else that can eat them, but nothing is a threat to a live alligator except the occasional human hunter. Alligators have around 80 teeth in their mouths which are constantly being replaced. You can tell the difference between an alligator and crocodile by the teeth. You can’t see the fourth tooth in the jaw when an alligator closes his mouth, but you can see it on a crocodile. Females have smaller territories than males, and a male’s territory may overlap with that of several females. Alligators are carnivorous. Their jaws can crack a turtle shell. They will eat fish, invertebrates, amphibians, mammals and birds. Small prey they eat whole. Large prey will be shaken into pieces and then the pieces consumed whole. Alligators are cold blooded. Their activity level fluctuates with the temperature. When it is cold, alligators will retreat to burrows where the shelter provides some moderate protection. The Alligator regularly dig long hollows in the water that fill with water so that alligators have water even when the water level drops in a pond over the summer. Alligators prefer slow moving rivers and always live in freshwater or swampy water, but never salt water. Unlike some crocodiles, alligators lack salt glands and cannot tolerate salt water for long.